Thanksgiving Candy Bar Pretzel Bites are easy to make with mini candy bars sandwiched between pretzels. A kid-friendly treat for Thanksgiving Day! 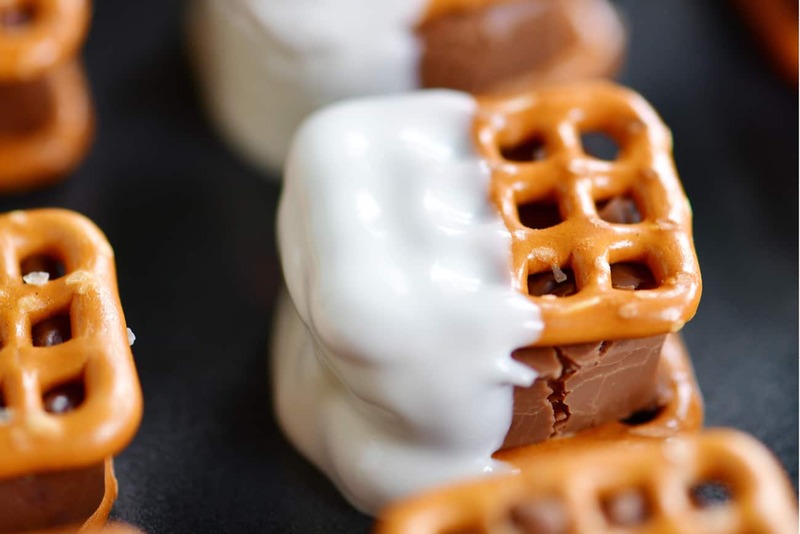 You can get your kids involved in the kitchen by letting them help make these candy bar pretzel bites. 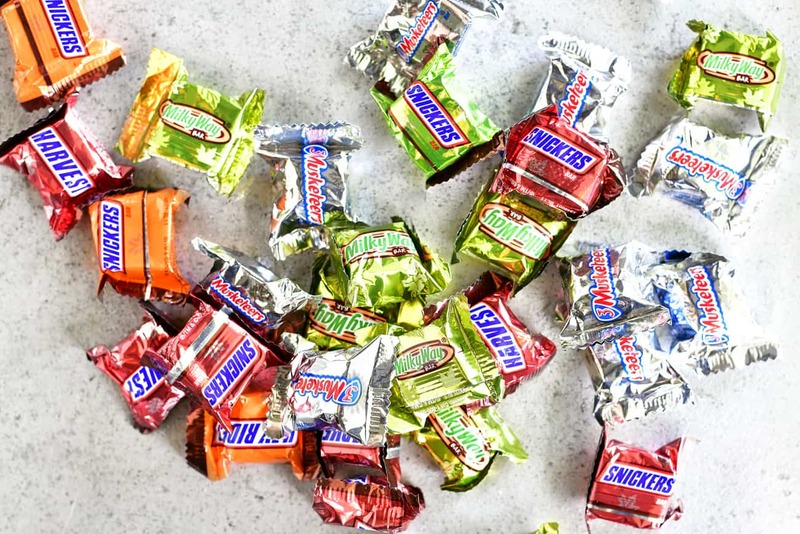 They can help unwrap the candy bars and put them on the pretzels. And kids LOVE adding sprinkles! 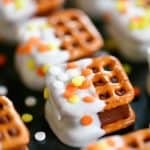 Where is the Thanksgiving candy bar pretzel bites recipe? In this post, I will share step-by-step instructions with photos for how to make the pretzel bites, as well as answering FAQs about the recipe and sharing a video. But you can go directly to the recipe by scrolling down to the bottom of the post. 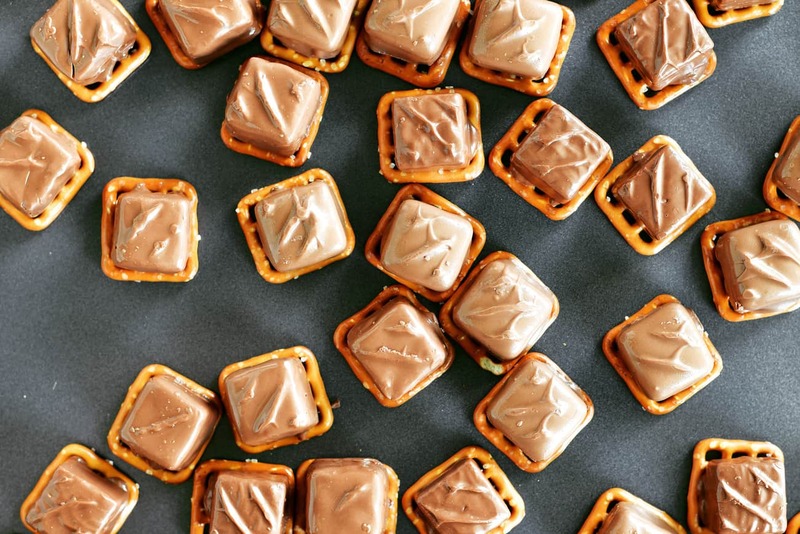 To make these candy bar pretzel bites, I love using the crosshatch square pretzels called snaps. 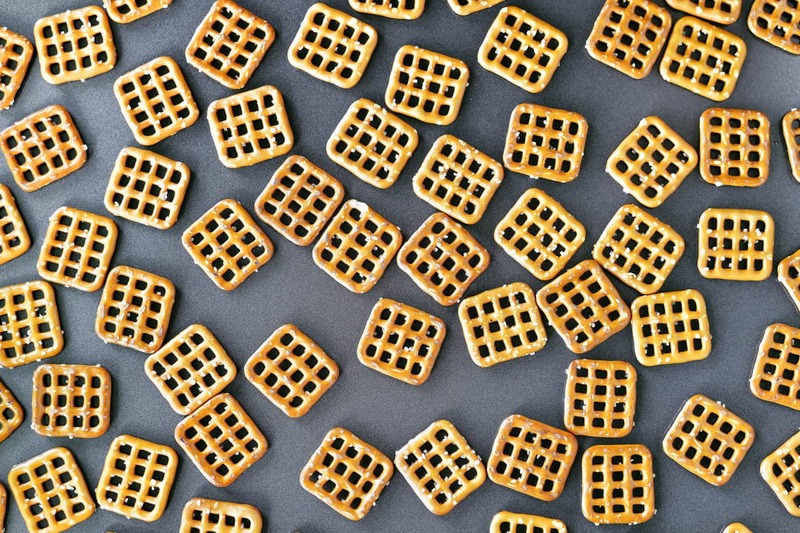 If they aren’t available in your area, mini pretzel twists would work too. 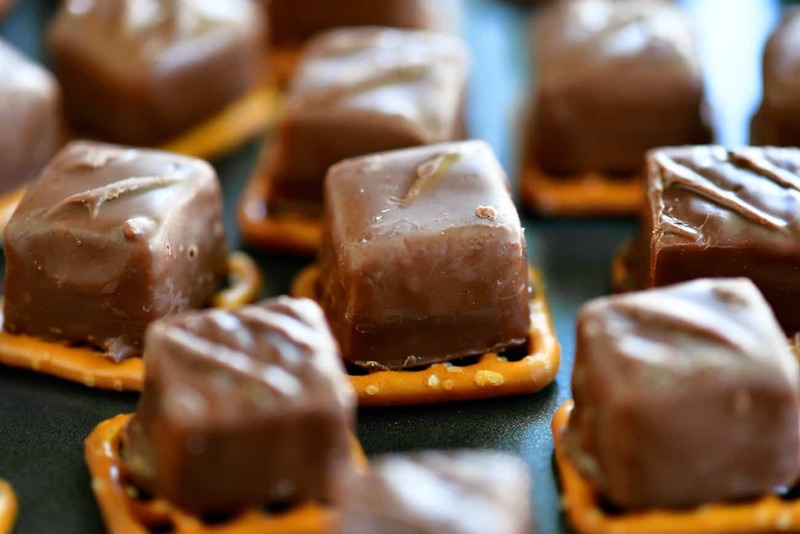 Put as many pretzels as you have mini candy bars on a baking sheet. For this recipe, I used mini Snickers, Milky Way bars and 3 Musketeers. These mini candy bars are the perfect size for the square pretzels. Remove all of the wrappers and put them on the pretzels. The candy bars need to be softened slightly so that the top pretzel will stick. I like to do this in the oven but they could be softened in the microwave for a few seconds on a plate if that is easier for you. Working quickly before the chocolate cools and hardens, squish another pretzel on top of each candy bar. Then, allow the candy bars to cool and harden. 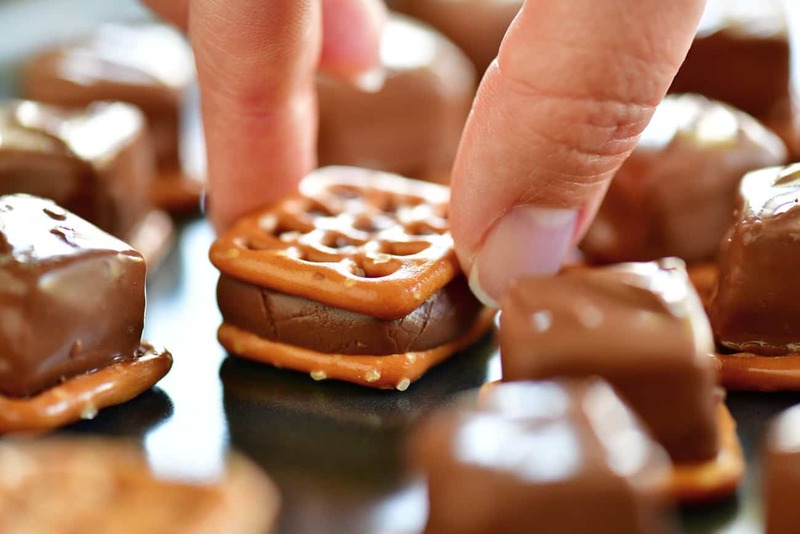 Once the chocolate has hardened, the candy bar pretzel bites are ready to be dipped. 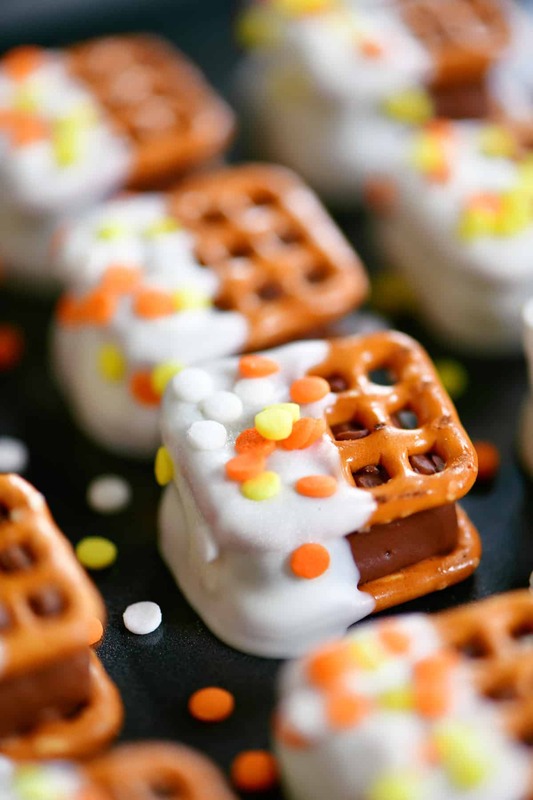 The candy bar pretzel bites can be dipped in white candy melts, melted white chocolate chips, or white almond bark. 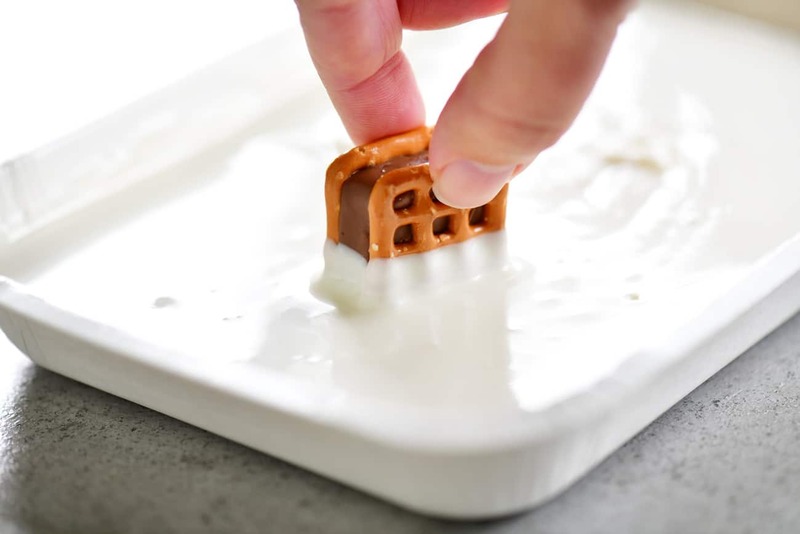 Place the candy bar pretzel bites on a silicone baking mat or baking sheet. For best results cover the baking sheet with parchment paper so that the pretzels can be easily removed. Don’t dip all of the candy bars at once because you need to add sprinkles before the white chocolate hardens so only dip a few at a time. Before the white chocolate hardens, add the sprinkles. For Thanksgiving, I used orange, yellow, and white sprinkles but these can be customized for any holiday or occasion. 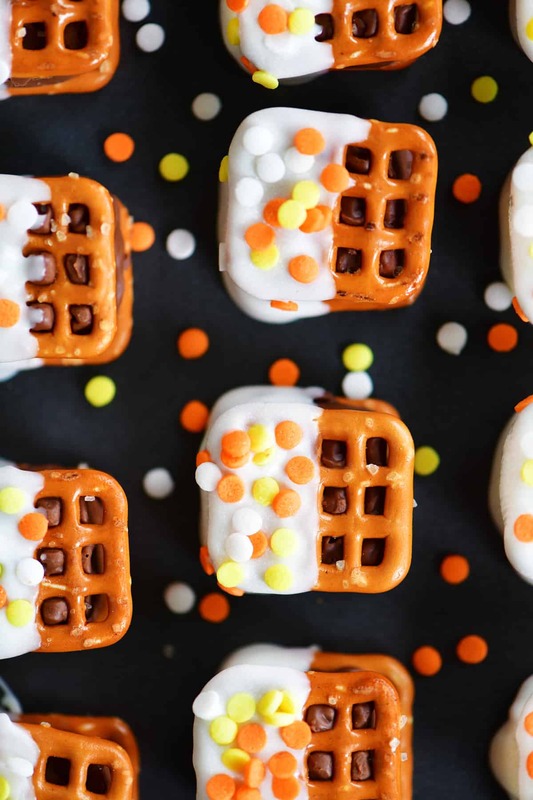 Adorable Candy Pretzel Turkey Bites from Suburban Simplicity: These Candy Pretzel Turkey Bites use Rolos and candy corn to make edible turkeys for kids! Chocolate Covered Pretzels in a Turkey Jar from Inside BruCrew Life: Bright colored sprinkles and chocolate covered pretzels make the perfect tail feathers for this fun no-bake Thanksgiving treat.